Churchill and Sea Power has provided me with one other new experience of the publishing world: being remaindered! I think that most publishers of low-print run academic books are willing to let their remaining stock sit in their warehouses for a long time after sales have slowed to virtually nothing. Trade publishers take a different view. Once sales substantially taper off, the remaining stock is frequently sold off at bargain prices to retailers, a process known as “remaindering”. This seems to occur most often to the hardcover edition of a book after the cheaper paperback edition is available. I knew this could happen eventually to Churchill and Sea Power , although I was still mentally unprepared last week when I saw a pile of hardcover copies priced at a mere $10 on the bargain shelves of my local Chapters bookstore. The paperback copy is still in print, of course, and should remain so for some time to come, I hope. And, after a bit of googling, I think the book has only been remaindered so far in Canada, although I might be mistaken about this. But, whatever the case, there is no doubt that, two and a half years after publication, my book is no longer shiny and new. Two reviews appeared just last week, but there probably won’t be many more now. The publishing world is moving on, and it’s time for me to do the same. I’m not done with Churchill, though. The last two years have been spent tying up many of the loose ends from Churchill and Sea Power . Space constraints prevented me from covering the pre-1914 period as thoroughly as I would have liked, and much of the research I couldn’t squeeze in has been used as the basis for several academic articles. The first of these, which began its life as a conference paper on “Churchill and Dominion Navies”, was recently published as ‘Sentiment vs Strategy: British Naval Policy, Imperial Defence, and the Development of Dominion Navies, 1911-1914’ in the International History Review (April 2015). I have another piece coming up soon in the Journal of Strategic Studies, entitled ‘The Myth of a Naval Revolution by Proxy: Lord Fisher’s Influence on Churchill’s Naval Policy, 1911-14. In addition, there are two articles in the journal War in History that examine other aspects of British naval policy under Churchill, particularly the controversial question of whether Britain was on the verge of a Fisher-inspired “naval revolution” in July 1914 (Spoiler Alert: it wasn’t!). Copies of the latter are available at Academia.edu: https://dal.academia.edu/ChrisBell. One of the other subjects I wanted to continue exploring after finishing up the text for Churchill and Sea Power was the failure of the Allies to provide Very Long Range (VLR) aircraft to cover the mid-Atlantic “air gap” before May 1943. It was clear from the research I conducted for the book that Churchill wasn’t really to blame for this problem, but I hadn’t been able to say with any certainty who was responsible. In fact, all that I was really certain about was that none of the explanations I had seen was entirely convincing. So I headed back into the archives to find the “smoking gun”. I was sure there must be a memorandum or minute somewhere in the Admiralty or Air Ministry records in which somebody in authority made a deliberate decision not to acquire VLR aircraft knowing full well that this would mean prolonging the Battle of the Atlantic. As it turns out, the answer proved to be much more complicated than I’d expected. But I am confident that I’ve finally pieced together what went wrong. To my great delight, the article in which I outline my findings was awarded the 2014 Sir Julian Corbett Prize in Modern Naval History by the Institute of Historical Research, University of London. It will be published in the July 2015 issue of the Journal of Military History. The other loose end I felt compelled to tie up was a rather more substantial one: Churchill’s role in the controversial Dardanelles campaign of 1915. This had been one of the most difficult parts of the book to write, and I could not cover it in nearly as much detail as I would have liked. I was able to provide a basic overview from the perspective of Churchill’s development as a strategist, but that was about it. I thought about writing up an article or two, but when my publisher urged me to submit a proposal for a new book, it occurred to me that it would take a full book really to get to grips with this subject. So this is the idea I pitched to them, just a few months after Churchill and Sea Power had been published. My editors and the referees they assembled to review the proposal agreed that this was a worthwhile project. My next book is tentatively titled Churchill and the Dardanelles: A Study in Myth, Memory and Reputation . My goal here is to look at Churchill and the Dardanelles through a number of different lenses – strategic, naval, political and cultural. 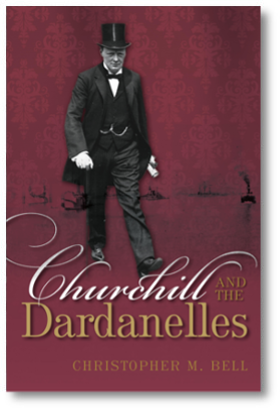 In part, the book will provide a myth-busting look at the high-level decision-making process before and during the naval campaign, but I also plan to continue the story past 1915 by looking at how the Dardanelles affected the development and evolution of the ‘Churchill Legend’ over the course of the century that followed.